Video interviews, panel discussions, articles and Q&As featuring Expert Q&A. With GDPR on May 25, you can expect to lose access to WhoIs data as we know it and begin many months of “growing pains” as the domain industry scrambles to figure out how to comply with GDPR. 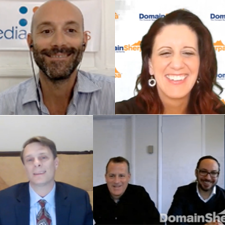 If you’re invested in domain names & want to lower your risks or understand strategies for the future, pay attention to these 3 experienced domain name attorneys! The greatest risk to owning a high-value generic domain name is having it taken away from you during a UDRP action. If you’re spending $10,000, $50,000 or $100,000 or more on a premium generic domain name and you want to lower your risk of UDRP, URS or lawsuit, then pay attention to these four attorneys and the tactics they suggest. Selling a domain name can be rife with frustration and false starts. The effort a seller puts in to contacting potential end users often leads nowhere. Other times, an unsolicited purchase offers will come in, only to have the buyer lose interest when the domain name owner counters with a specific number. In one case, a large domain investor recently lost a $200,000+ sale by not coming down $10,000. So what can you do to close more sales? Three experts chime in to help out. There are a plethora of domain name tools and services available on the market. Most people who are interested in domain name investing have to learn the ins-and-outs of domaining by trial and error. However, with the right advice and the right tools you can get up-to-speed quickly, and be more productive in your domain name buying and selling. EXPERT Q&A: Should I Let Unused Domain Names Expire From My Portfolio? Many of us are addicted to buying domain names. Often times we hold onto them with no likelihood of development, no plans to actively market, and only a slight chance of receiving an unsolicited offer. The problem then is that our domain name portfolios (with their associated renewal fees) become too large for our budget to allow. So we turned to the experts (the folks who have wrestled with this situation multiple times) to ask what they would do.